Products will be available for demo at MWC Barcelona on MyKronoz booth (#CS118) from Feb 25-28 2019. ZePods, with a USB-C charging case boasting the familiar look of a sleek lighter. Available in April 2019 for a MSRP of 79,90€/$ only. ZePods+, with a Qi-certified wireless charging case whose shape has been greatly inspired by Swiss traditional pocket-watch. Available H2 2019 for a MSRP of 99,90€/$. "Building on our Swiss DNA for design and our strong background in wearable technology, we believe that MyKronoz has a tremendous opportunity to seize in the flourishing market of wireless earbuds. The launch of ZePods appears as a natural and strategic evolution for our company to leverage expertise in developing affordable consumer-driven products and diversify to offer a full ecosystem." said Boris Brault, MyKronoz Founder and CEO. - ZeTrack - a slim and full-featured HR activity tracker with color touchscreen. MSRP: 29.90€/$ - Launch date: end of March 2019. - ZeNeo - a real powerful smartwatch with mic & speaker that looks like a sleek activity tracker. MSRP: 59.90€/$ - Launch date: end of April 2019. - ZeRound3 Lite - the go-to smartwatch designed for your active lifestyle. MSRP: 79.90€/$ - Launch date: end of April 2019. - ZeRound3 - the genuinely stylish connected smartwatch with AMOLED display. MSRP: 99.90€/$ - Launch date: end of March 2019. The rest of the range includes ZeSport2, a multi-sport GPS smartwatch, already available at a MSRP of 149.90€/$. MyKronoz will continue to innovate in H2 2019 with ZePop - the hybrid smartwatch that blends fashion and tech. MSRP: 129,90€/$ as well as ZeTime2 - a stainless steel hybrid smartwatch with microphone, AMOLED display and real mechanical hands. MSRP: 199,90€/$. ZePods, as well as the MyKronoz full new wearable collection will be on display and available for demos on the MWC 2019 show foor at the MyKronoz booth in the Congress Square (Booth #CS118) February 25-28th, 2019. MyKronoz is part of BOW Group, a global player in lifestyle consumer products, operating worldwide in the design and wearables markets with its 2 brands: MyKronoz and LEXON. Since July 2015, BOW has opened up its capital to Next Stage AM, then, in 2017 to PM Equity Partner - the corporate venture fund of Philip Morris International. MyKronoz ZeTime has convinced over 40,000 backers in more than 100 countries and became the world's highest funded hybrid smartwatch with more than $8 million raised, as well as the largest crowdfunding campaign ever from a European company and the most backed product of 2017 on Kickstarter. 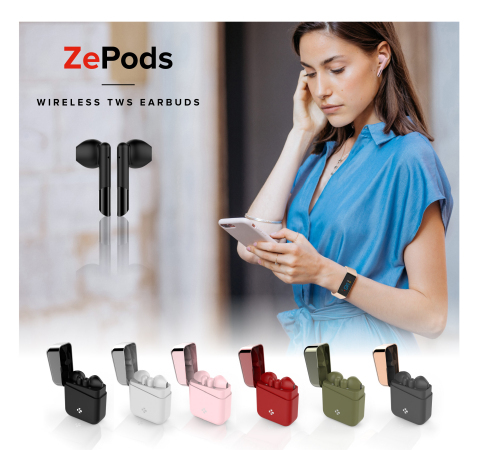 MyKronoz introduces ZePods fashionable and colorful true wireless earbuds, together with a new line of affordable smartwatches.